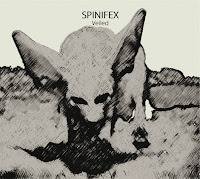 To celebrate their 10-year anniversary, Dutch shape-shifters Spinifex have released two new albums—Veiled, from the core quintet, and Maximus, with seven guests from around the globe. (They’ve also released a 5-disc set packaging these two with Triodia and last year’s Hipsters Gone Ballistic, their first two albums, plus a live compilation—quite a good deal if you want to buy in bulk.) What’s exciting—and impressive—about Spinifex’s music is the way the group manages to absorb and synthesize a variety of influences (jazz, punk, metal, Indian, etc.) and then produce something greater than a simple grab-bag of styles. A parallel feat, they’re also able to foreground technical mastery via incredibly tight, complex structures and at the same time leave room for freer play and discovery. 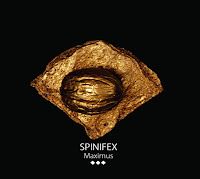 If you haven’t heard Spinifex yet, now is the perfect time to dive in. As tight and disciplined as a group like this needs to be in order to do justice their wide-ranging influences, Spinifex aren’t afraid to explore unmapped territory, either. 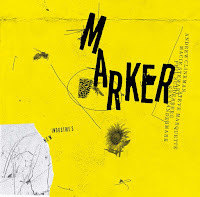 “Bamlib” and “Bilmab,” two short pieces at the very center of the album (note the palindrome), tread the border between composition and improvisation, a balancing act kept up by “Knoest” and “Vibrate in Sympathy.” While the freer passages themselves on Veiled are often wonderfully chaotic, for better or worse we never quite lose the sense that the ultimate destination is predetermined. The longest track and closer, “Particle R,” develops from tense ambience into a bouncy groove—grounding another strong trumpet solo—and from there into a darkly funky drum feature, Moser whipping polyrhythms over the hypnotic guitar/bass ostinato. As if all the album’s disparate voices had finally caught up with each other, Veiled ends with a moment of grand fury, well worth listening up to. 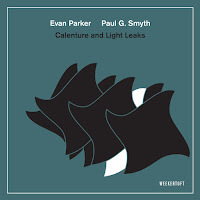 Recommended—especially for fans of technical, adventurous, hybrid jazz. But it would be a shame to stop short of Maximus. Truly earning the album title, here the quintet is augmented by six—yes, six—bonus horns (plus another drummer). The group certainly doesn’t fail to make good use of its guests, putting them to work and showcasing them at the same time. 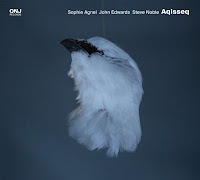 These compositions can’t be easy to learn, but the added players go beyond following along to indeed “maximize” the potential already well established on the above album. The guests, an international assembly, include: Bart Maris on trumpet, Matthias Muche and Jeb Bishop on trombones, Pascal Rousseau on tuba, Edoardo Marraffa on tenor sax, Josh Sinton on baritone sax, and Onno Govaert on drums. For my money, the six additional horns overload the music in the most wonderful way. Where Veiled seemed perhaps a little too controlled at times, the tunes on Maximus are bursting with a multiplicity of competing voices. 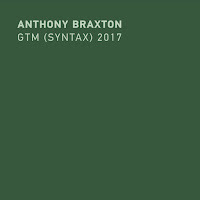 The second drummer creates the effect of just a touch of welcome and inevitable looseness as the super-group navigates the labyrinthine compositions. Listening to the exuberance of the playing, somehow always escalating, you get a sense of mutual egging-on, of a well-met challenge to go all out. Everyone here seems to bring out the best in each other, perhaps even things otherwise inaccessible. To mention only a few highlights… “Ost,” the opener, gives three and a half minutes to the horns—cinematically melodic and freely improvising by turns—before rocketing into Spinifex’s familiar brand of complex ensemble playing, only to fall apart and then reassemble into a lumbering groove that wouldn’t be far out of place on an early King Crimson record. The reprised “Knoest” offers a chance to compare the two line-ups side-by-side, and “Mongibello” features a nice imitation Threadgill melody. “Stupid Neckchain” is another technical showcase, as voice by voice the horns trade phrases: slurring, muttering, whispering, growling—as if to throw off the titular restraint. And “Birch,” punctuated again and again by a series of accelerating stomps of sound, is an 18-minute monster. 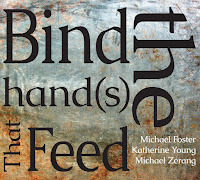 We get everything from snaking unisons to free-form blowing—a bountiful piece from a bountiful group of musicians. Great group and 2 great albums! !